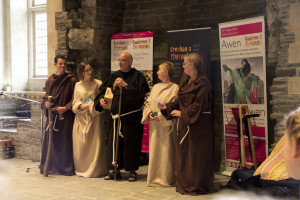 Storytelling in Pembrokeshire and West Wales. Our lead guide Andrew is a professional storyteller. He is a gifted teller of tales. Tales from the Mabinogian, Welsh tales of myth and legend and tales of Pembrokeshire past and modern. Andrew has trained in the oral tradition of storytelling. Ancient tales of myth and legend were originally passed down from one generation to the other for many centuries. It was the main vehicle for passing the rich traditions and tales of the people and cultures. As the tales were written down and the people began to read the profession of the story teller lessened.Today the tradition of the oral storyteller is still alive. We are able to tell stories of ancient and new at all venues from village halls to public houses, hotels and restaurants. Ocean Hotel , Broad Haven – 60th birthday party. Just a couple of lines to thank you for your storytelling last Tuesday evening at the Ocean …… the folk stories you related gave a great atmosphere to the evening. I know my wife enjoyed it all, and our two guests from Warrington were very impressed – it’s so good to know that the oral tradition in Wales is being kept alive. Needless to say, I’d have no hesitation in suggesting to anybody wanting an evening infused with ‘something special’ that they should contact you to arrange for some stories. I must admit that I seldom look at the local paper but, if you don’t advertise your storytelling service already, you certainly should. Please get in touch and experience the gift and art of the storyteller.